Other participants include John Phillip Abbott, Daniel Albrigo, Scott Anderson, Brian Belott, Marissa Bero, Michelle Blade, Morgan Blair, Eric Carlson, Jacob Ciocci, Brian Cooper, Matthew Craven, Ryan De La Hoz, Bill Donovan, Lauren Ivy Dudko, Austin Eddy, Cassie Edwards, Madeleine Ehrhardt, William Emmert, Ron Ewert, Amir H. Fallah, Andreas Fischer, Travis Fish, Ted Gahl, Richard Galling, Ethan Gill, Magalie Guerin, Trenton Doyle Hancock, Joseph Hart, Cody Hudson, Huskmitnavn, Matt Irie, David Jien, Kiel Johnson, Stacie Johnson, Ben Jones, Kara Joslyn, Michael Krueger, Alex Kvares, Jessica Labatte, Jeff Ladouceur, Eric Lebofsky, Austin Lee, David Leggett, Sofia Leiby, Matt Leines, Dave Lloyd, Matt Lock, Tom Long, Morgan Manduley, Keegan McHargue, Taylor Mckimens, Bill McRight, Easton Miller, Mark Mulroney, Marcie Oakes, Jonah Olsen, Robyn O’Neil, Hilary Pecis, Joyce Pensato, Cleon Peterson, Josh Reames, Carmen Price, Sara Greenberger Rafferty, Scott Reeder, Tyson Reeder, Amber Renaye, John Riepenhoff, Steve Ruiz, Louis Schmidt, Allison Schulnik, Adam Scott, Eric Shaw, Casey Jex Smith, TL Solien, Edra Soto, Ben Stone, Devin Troy Strother, Marissa Textor, Jeremy Tinder, Talia Shulze, James Ulmer, Sarah Weber, Nick Wilkinson, Sara Willadsen, Bud Wizzo, Scott Wolniak, and Eric Yahnker. They will all be presenting their answer to the question above with the work showing until November 29th at the gallery space in Brooklyn. Categories: Contemporary Art, Low Brow & Pop Surrealism, Shows & Events, Teasers. 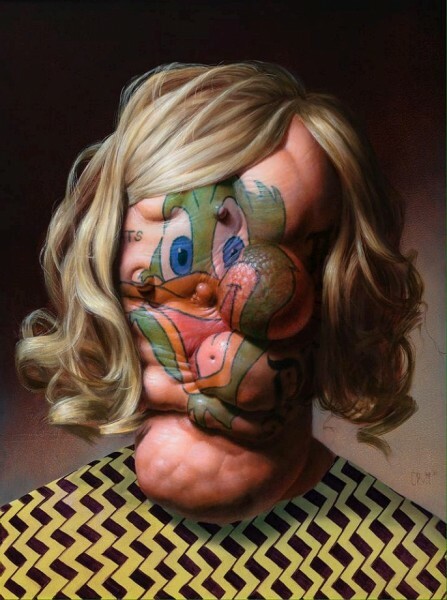 Tags: Christian Rex Van Minnen, Contemporary Art, Low Brow & Pop Surrealism, New York, Shows & Events.